Dangerous Times with the Monotype Casting Pot. 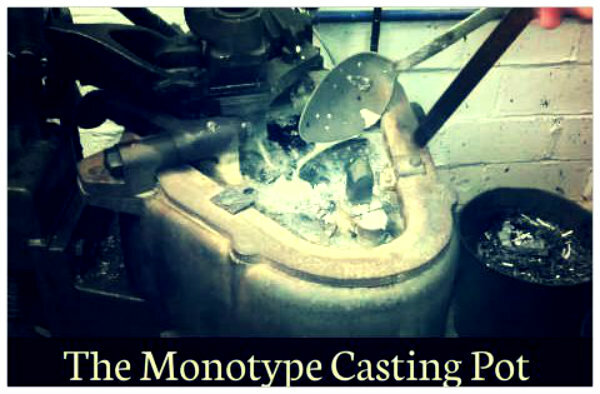 AS AN APPRENTICE compositor I was sometimes roped into operating the Monotype caster. The hypnotic clackety clack sounds stay with me now! In idle moments I would place individual types on the edge of the melting pot and watch them as they rapidly dissolved back into molten metal, their short lives curtailed in moments. I learned a trick that gave me lots of ‘cred’ with my colleagues – I would secretly coat my forefinger with thick machine oil and then much to the astonishment of onlookers plunge said finger into the melting pot. Timing was crucial and after mentally counting out ‘one thousand, two thousand’ I would withdraw my by now smoking finger. Had to get it right though as mistakes could be very painful. This may have contravened modern health and safety legislation I suspect. This entry was posted in PRINT, WORDS & BOOKS and tagged hot metal. Bookmark the permalink. ← Printing WWII Food Ration Books at the Old Guv.